Excuse me, Rogue One: A Star Wars Story. The title and the absence of an opening crawl are two of the most mind-boggling things about this film. Regardless of that, and its other flaws, I thoroughly enjoy this movie; it’s really good. It accomplished many things and proved that a Star Wars movie outside of the saga films can work in all aspects: narratively, financially, critically, and by fan reception. However, would it have succeeded as much without the presence of Darth Vader in the film and the marketing? That’s a debate to be had but there is no debate on whether or not the film was a success. The quality of the movie, however, is a different story. With Star Wars: The Last Jedi finally here, it’s time to do my annual re-watch review where I give my thoughts on the most previous Star Wars movie a year after its release. In this case it’s Rogue One (which I will refer to the movie as to save space and time as opposed to writing the whole title out). FYI: this will be a spoiler review if that was not implied but I’m guessing you’ve seen the movie if you clicked on the article. There were two separate viewing experiences to have with Rogue One going into it: those who had read the prequel novel Catalyst and those who hadn’t. I can only speak from one side having listened to the audiobook of Catalyst before the movie came out and from my perspective, the information I gained from Catalyst elevated Rogue One as a film. I do not think this is fair as someone shouldn’t have to read a novel in order to fully understand a movie. While I don’t think you necessarily HAVE to read Catalyst before watching Rogue One in order for it to be an enjoyable experience or make sense, I do think the book makes the movie a lot better. Catalyst sets up the characters of Galen Erso (Mads Mikkelsen), Lyra Erso (Valene Kane) , and Orson Krennic (Ben Mendelsohn). It explores their origins, their personalities, and their motivations which gives them a lot of depth. The opening of Rogue One features these characters in a prominent way which I imagine does not have the same effect if one hasn’t read or listened to Catalyst. 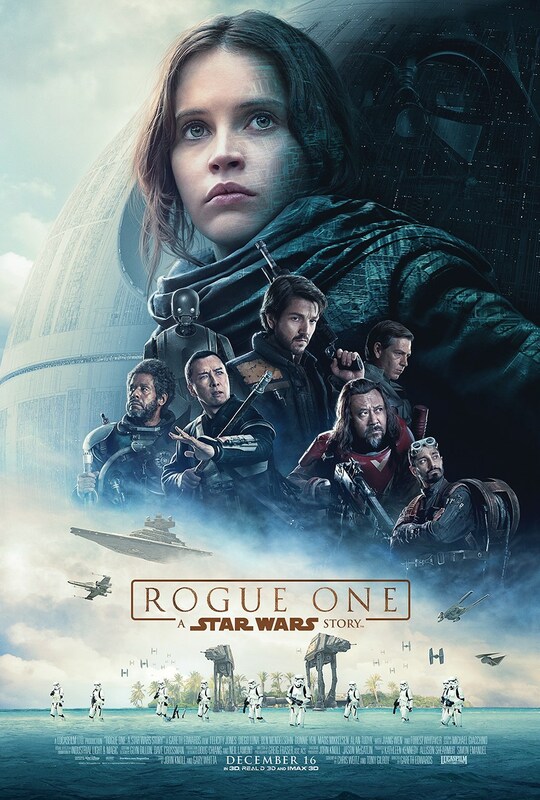 My point being, I am going to talk about Rogue One from the perspective of someone who listened to the Catalyst audiobook before seeing the film, which I highly recommend doing if you haven’t had the chance. I also recommend the Jyn Erso novel, Rebel Rising, in between Catalyst and Rogue One if you can fit it in. These three make for a nice trilogy of stories following the Erso family. That being said: I really really like Rogue One. I won’t go as far to say I love the movie. I certainly love elements, moments, and scenes within the film but the word love should be used rarely when describing how one feels about an entire movie in my opinion. I’ve seen Rogue One about a dozen times and watching it a year later, just like each re-watch before that, the movie gets better every time. However, as I become more fond of the things I love in the movie, I also become more… let’s say annoyed with the things I don’t like. Let’s first take a look at the things I enjoy in Rogue One and what I appreciate even more this time around. The New Characters: I’m including Jyn in this because even though I was first introduced to her in Catalyst, she is a new character to most and I did not meet adult Jyn until Rogue One. Ironically, I did not love the performance by Felicity Jones the first time around. I thought she was over-dramatic and playing the angry anti-social part too heavily. After my second or third viewing, and even more so now, I realized she is playing her character perfectly considering what the character has gone through. I had the same experience with Cassian Andor (Deigo Luna); I thought he was just portraying a douche but now when I watch it, I see a character who really cares about the cause of the rebellion and the overall state of the galaxy. He has also been through a lot and we as the audience don’t have to know exactly what he’s been through to feel his pain. Mostly thanks to Luna’s performance. Arguably the two best characters in the movie are Chirrut Imwe (Donnie Yen) and Baze Malbus (Wen Jiang). In my opinion, they stole the show for the most part and talk about emotional when they sacrifice themselves to achieve something essential to the mission in the third act. I’ll talk more about them later on in this review but I honestly could watch a movie about just them two after watching Rogue One. Challenging Chirrut and/or Baze for favorite character in this movie is none other than the droid K2-SO. To be honest, he might be my favorite droid in Star Wars ever! I know, that’s crazy but I said “might”. I just think he is hilarious and I love his and Cassian’s relationship. I also get the most emotional on his death. I don’t know why that is. There’s something about robots who weren’t meant to have souls but through their personalities are just as alive as humans in the Star Wars universe. The Action: Rogue One arguably has the best overall action in any Star Wars movie. The hand-to-hand combat involving Jyn is brutal and awesome. The action scenes when Chirrut goes beast-mode are incredible and very well choreographed. The ground battles with blasters are intense and feel like a real war movie in Star Wars. The space battles are legit and challenge some of the ones from other films. Overall, when you consider all the different types of action that take place and the quality of it in those scenes make it a very entertaining watch from an action standpoint. You also can’t forget the Vader hallway scene but that’s more of a slaughtering than an action scene. Improving A New Hope: A New Hope, or simply Star Wars, is my favorite movie in the franchise but one thing that never made sense is why there was a thermal exhaust port that if hit perfectly, would blow up the entire station. After listening to Catalyst and watching Rogue One that plot hole changed from one of the biggest question marks in Star Wars canon to one of the most intelligent story points, in my opinion. Also, how the movie literally transitions right into the first scene of A New Hope is so awesome and something that has rarely ever been done in film as far as I know. I enjoy several other elements of Rogue One but the things mentioned above are my main positives. It is right in the middle of the pack as far my favorite Star Wars films go and that’s not a bad thing since I really like to love almost every Star Wars movie, with Attack of the Clones being the exception, and four of the films in the franchise are some of my favorite movies of all-time. So this movie isn’t doing so bad as far as my rankings. Rogue One does have its problems though which prevents it from being really great. Lack of Character Development: I know I said I like the new main characters but there are a few characters that were very underdeveloped who could have used some more back story or screen time to make the film better. This mostly applies to the three characters I mentioned in the beginning of this article: Galen Erso, Lyra Erso, and Orson Krennic. For me, having listened to Catalyst, I knew and was attached to these characters. The death of Lyra meant so much more to me and most of the audience did not know that Galen and Orson were longtime friends, which made Orson ordering the death of Galen’s wife much more meaningful. Do you see what I mean? If the movie took a few lines of dialogue to establish a few things then it would’ve made the story of these three characters significantly more important. They also could have given Galen much more screen time and maybe not have killed him off after not having a lot of it. It was great motivation for Jyn but I would’ve liked to have seen Mads Mikkelsen on screen more. Saw Gerrera: I was excited to see Saw on screen in live-action. For those of you who don’t know, he had a story arc in a season of The Clone Wars. I thought it was so cool that Lucasfilm was taking a character from one of the animated shows and bringing them into live-action. It was a statement that they aren’t afraid to do that and I think there are some great characters in animation, the comics, and the novels who could do great things in live-action. However, Saw ended up not being one of those. Forest Whitaker is a great actor and I believe he was doing what he was asked to do by the director. My disappointment with Saw lies withing his character and performance being WAY too over the top with the way he talks and the breath mask he used constantly in the middle of conversations. This is a shame because I like Saw in the animated show and in the novels Catalyst and Rebel Rising. I feel like they could’ve executed his character a lot better in Rogue One. The Bor gullet and Bodhi Rook: You’re probably thinking, “What the hell is a Bor gullet?”, well it’s the stupid creature that Saw Gerrera is housing in Rogue One which he uses to torture and interrogate Bodhi Rook (Riz Ahmed). I think this creature is completely unnecessary and just did not look good. It also made two of my other negatives even worse which adds to my annoyance of the Bor gullet. It was just another addition to me not liking most of the scenes that involve Saw Gerrera (with the exception of the reunion between him and Jyn which was great) since Saw is the one who had this creature. It also played a huge part in me not liking the character of Bodhi Rook. Look, I think Riz Ahmed is a really really good actor (if you’ve seen Nightcrawler then you know what I’m talking about) but I just didn’t like the way he played Bodhi in this movie. Right from the top he is overly intense and then when his mind is tampered with by the Bor gullet, it just goes to another level. I don’t hate his character but he is my least favorite of the Rogue One crew. I have other small negatives but those are my major concerns with the movie. Not counting the prequels, out of the rest of the Star Wars movies it has the most negatives for me but ultimately it still is a really good Star Wars movie. 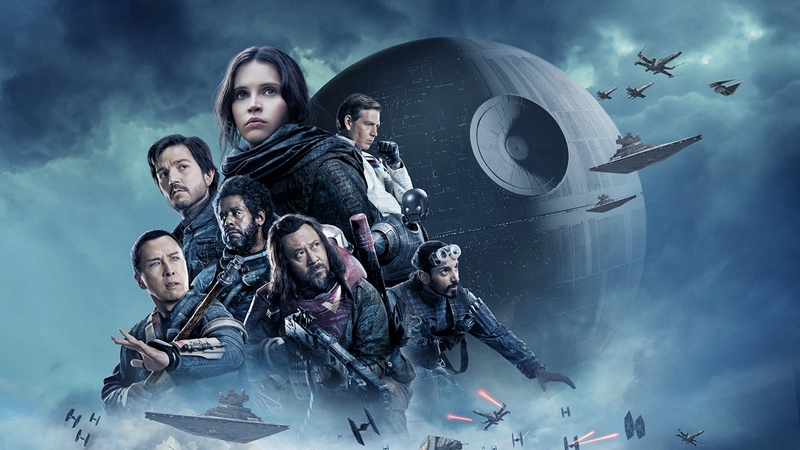 The bottom line is Rogue One: A Star Wars Story is a good movie and an even better movie as an addition to the Star Wars universe as a whole. It shows that there are important characters who do as equally important things as the main characters in the saga films. We as film fans have just never heard of them until Lucasfilm decides to tell their story. I’m glad they told this one because I’ve fallen in love with characters like Jyn Erso, Chirrue Imwe, and K2-SO. I’ll forever be grateful that it made my favorite movie of all-time, Star Wars: A New Hope, an even better movie. Rogue One may not be as flashy, meaningful, or successful as the saga movies but it makes for one damn good viewing experience that adds so much rich history to the galaxy far far away. I look forward to re-watching it for many years to come. Thank you for reading my Rogue One re-watch review! Let us know in the comment section what you think about Rogue One a year later. Do you agree with me on some points or not? We’d love to hear your thoughts!